At 39.5m long the Kaya Güneri V is one of the few larger and spacious gulets in Turkey with 6 extremely well appointed cabins. She has 2 master cabins, 2 double bed and 2 twin bed cabins, each with private en suite bathrooms. All cabins are fitted with air-conditioning, TV, DVD players, stereo music systems and mini bars. Excellent. 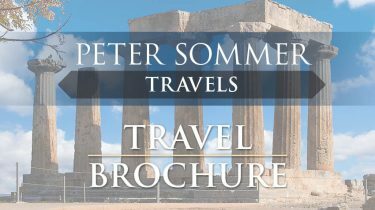 Peter Sommer Travels was our choice due to the serious archaeology chops of the company and its guides. What a delight then to find the guides as adept at booking a gourmet meal and arranging for us to make it there as to discussing the finer points of spolia. The tour operator was generous, covering many admissions fees and other expenses that we had expected to pay ourselves. While not inexpensive, they provide wonderful value for the money in every way. We are very happy to recommend them.